Beginner Anyone can do hikes rated 'Beginner'. They typically involve short walks on flat terrain, and there may be occastional inclines. At most, it will be steep for very small climbs. These hikes will never usually take more than an hour and a half and are best visited as a side trip, unless you live very close to one. Easy Easy is a good difficulty level for most young children. 'Easy' hikes are never more than five miles, and will not typically have any very rough terrain. You can expect to see moderate to difficult inclines, but the steeper the incline, the shorter the hike will be. You can usually complete two nearby 'Easy' hikes in an afternoon. Moderate Moderate hikes can have a rough trail with a grade about the same as an 'Easy' hike, but with more prolonged steepness and more distance. Similar to 'Easy', the more difficult the grade and trail surface, the shorter the hike will be, and vice versa. A hike with this difficulty could be done in an afternoon by itself. Hard With hikes rated 'Hard', you can expect to see constant, difficult grades, with some occasional rock scrambling and/or extreme steepness. 'Hard' hikes have a moderate to long distance, never more than eight miles. Trail surfaces are always rough. These hikes can take anywhere from a half day to a full day. Very Hard 'Very Hard' hikes should be attempted only by those who have had much hiking experience and are conditioned for long distances and difficult climbing. Be prepared for constant strenuous grades and rock scrambling. These hikes will not be more than ten miles long, and may be much shorter if the trail is extremely steep. Do not plan any other destinations on the day you do one of these hikes. Extreme 'Extreme' is the hardest difficulty level on this website. You should make sure you can complete 'Very Hard' hikes fairly easily before trying an 'Extreme' hike. Hikes are usually rated this difficulty for having a terribly rough trail surface, lengthy stretches of severe grades, very difficult distance, or all of these. Similar to 'Very Hard' hikes, these hikes should not be done on the same day as any others. There is no limit on how long 'Extreme' hikes can be. Distance - Distance is always given round-trip. "Out-and-back" is the standard type of hike; The destinations are reached by a single trail, which you must hike both ways. A "loop" hike is also common; One or more trails are used to create a continuous trip around the destinations, so that you never have to retrace your steps. "Out-and-back with loop(s)" is a combination of the two; A single trail is hiked to a certain point, where a loop is used to visit the destinations and return to that point. Elevation (of mountains or lakes) - The altitude above sea level of the summit or water. Prominence (of mountains) - Prominence is a measure of how much a mountain stands out from its surroundings. It is the vertical distance between the mountain's summit and the lowest point on the highest ridge connecting it with a higher mountain (the key col). If a mountain has a prominence of 500', that means if you are standing on the summit and you want to walk to a higher place, the very minimum vertical distance you must descend in order to climb up to another place higher than the summit is 500 feet. Elevation Gain (of ascending trails) - The vertical distance climbed from the trailhead to the destination. This figure, along with the distance and a topographical map, can tell you a great deal about the difficulty of the hike. If any amount of climbing uphill is required to return to the beginning of the hike, this figure is also listed. Height (of waterfalls) - The height of the waterfall. River (of waterfalls) - The water source of the waterfall. Type (of wetlands) - The ecological type of the bog or swamp. Seacoast Region - This is the smallest, lowest region and is the most limited for hiking. So far we have only found five notable hikes in this region. Two are short climbs to low hills with scenic views and three are walks near the ocean. Merrimack Valley - Also mostly flat terrain and urban like the Seacoast. Most hiking opportunities are found in state parks and nature preserves. There are no significant mountains, but there are a few small hills with scenic views to climb. Monadnock Region - By far the best hiking in southern NH is found here. The centerpiece is of course Mt. Monadnock, but the Wapack Range (the only named mountain range this far south in our state) is another great feature, being completely traversed by the 22-mile Wapack Trail, which provides a multitude of short day hikes to small, ledgy hills with the region's best views. There are also plenty of isolated hills to hike in nearly every part of this region. Finally, the Monadnock Region contains the best (and only) waterfalls of southern NH. Dartmouth/Lake Sunapee Region - This region does not have quite the volume of hiking opportunities as the Monadnock Region, but it does have far more isolated mountains with trail networks of their own, including Cardigan, Kearsarge, Ragged, Smarts, Cube, and Sunapee, which all have more interesting views than Mt. Monadnock. There are also several hidden gems that are overshadowed by these big names as well. Lakes Region - Unquestionably the best hiking outside of the White Mountains is found here. Three distinct small mountain ranges with extensive trail networks are positioned around the many lakes. Their many open summits almost all have excellent views of the two major lakes, Winnipesaukee and Squam, at lower than average effort. The Belknap Range in particular has one of the best-maintained trail systems in our state. There are a few waterfall and forest walks in the area that are impressive as well. White Mountains Region - This is the reason New Hampshire is known for its hiking. Any type of adventure you are looking for you will find in the White Mountains. Mountains range from beginner climbs with disproportionately good views like Bald Mountain in Franconia to the "world's most dangerous small mountain", Mt. Washington of course. The trail system, maintained by a huge number of outdoor clubs, is so massive and interconnected that one could travel from one side of the region to the other using almost only hiking trails, and most mountains have a variety of trail routes to choose from. Scenic views from the top vary wildly in different ranges and areas - some smaller mountains will have stunning 360-degree views, while a peak that is 3000 feet higher might be mostly forested. Also, almost all of NH's famous waterfalls are found in the White Mountains. It would take an individual many years to completely get to know the sheer variety of the White Mountains, and the excitement of discovering all there is creates a habit of returning time after time. Because of the volume of hikes in our library in this one region, we have split it into southwest and northeast for our search. We have defined the southwest portion to include hikes which are accessible from near I-93 or roads to the west and from near the Kancamagus Highway or roads to the south (most notably Rt. 49, Rt. 113A, and Rt. 3 until Twin Mountain). The northeast portion includes hikes which are accessible from near Rt. 302 or roads to the north and east (most notably Rt. 2, Rt 16, and Maine Rt. 113 through Evans Notch). 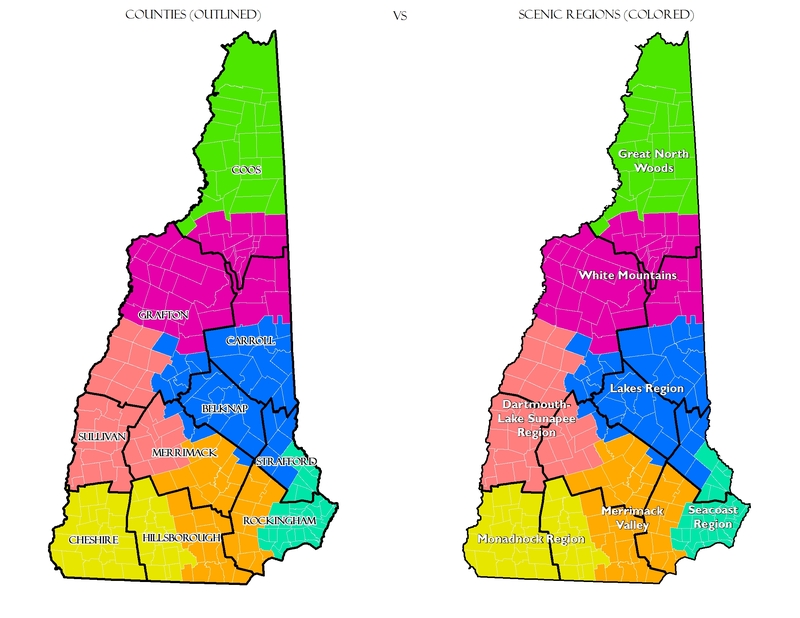 We have separated the region out this way because the southwest portion will cover most hikes that are under 1.5 hours drive from Concord, and the northeast portion will cover most hikes that are around 1.5 hours or more. Great North Woods - This region, despite its scenic beauty, has far fewer hiking opportunities than the White Mountains because of its remoteness. More hiking is found in the southern part, closer to the White Mountains. The region has several significant mountain ranges which rise to heights above anything south of the White Mountains, but very few of the high peaks actually have maintained trails to the top. The lack of any sort of trail system like in the Whites is due to the increased driving time from populated areas - most people don't realize that it takes almost two and a half hours to reach the top of NH after leaving I-93. The few hikes that you will find in any part of this huge region, however, are iconic. To enable the new trip-planning guide, check the box with the same description on the "Find a Hike" page before searching. Now when you search for hikes, each result will display a color-coded list of eight attributes, ranked on a scale of one to five that will help you choose the right hike for whatever weather your day has or whatever season you are hiking in. You can get details on the system we used to rank each hike on our scale by hovering over each icon in the legend at the top of the search results, but here are a few extra tips on how to use our guide. Below are the eight attributes we have ranked our hikes on and how you can use to decide which hike to choose for the current conditions. Please note that while we try to present the facts in the best way for our website viewers to use, some things, like how suited a mountain view is for fall foliage viewing, are inherently subjective. In fact, placing any of these attributes on a 1-5 scale forces opinions onto them. We have written this guide from personal experience only, and some may disagree with our ratings. As far as these pertain to safety, you alone can determine whether any particular hike is suitable under any circumstances. While we would like to boast that using our guide will ensure finding a safe and fun adventure on any kind of day, it is not sufficient to be completely sure of either of those. Other resources, such as trail conditions websites, can boost your confidence that you have made a good choice, but there is really no way to be certain that everything will go as planned when dealing with the outdoors, especially here in New Hampshire. If you think we should make a correction to any specific rating given to a hike by this guide, please let us know by sending a message to the email address found at the bottom of this page. Summit Visibilty - This attribute ranks the extent of the summit view of the mountain(s) on the hike if applicable. You can use this to pick a far-reaching view if your day has perfect viewing conditions or stay with a limited view on a cloudy or hazy day. Notice that our process for rating summit views does not include the number of directions you can see from the outlook. We are talking about how much you can actually see in any direction, because that is what commonly changes due to summer humidity and haze. This is something you can judge from anywhere that you can see a distance. For example, while driving down a hill where you can see for a few miles over the trees, you can observe how well you can see the far-away terrain to decide if it is a good day to climb a mountain from which you can see a great expanse or if it is better to hike to somewhere that has a view of nearby mountainsides within a few miles. Note - we will also provide this ranking for any non-mountain hikes that have a view. Trail exposure - This attribute ranks how open to the weather the route taken by each hike is. This is helpful to know if it will be cold or windy so that you can choose a hike with more protection from the elements. This is also a good idea to know because it will help you determine how easily you can escape or take shelter in unexpected bad weather. To be better prepared, you should read the trail descriptions to see exactly where along the hike the openings will be. Note that if the majority of the trail is completely forested, but there is a short open section to get to the summit of a mountain, we will rank the hike with disregard to the negligibly short section at the top, because the final trail section will be included in the summit exposure ranking. Summit Exposure - This attribute ranks how open to the weather the summit of a mountain in particuar is if applicable. Whereas the trail exposure concerns safety in adverse conditions, knowing summit exposure is more for comfort, since shelter can be taken in bad weather by simply leaving the summit and walking down the trail, or just turning back before you arrive. Also remember that elevation is a major factor in summit conditions. A 2000-foot mountain rated as a 5 might be safer and more comfortable when cold and windy than a 4000-foot mountain rated as a 3. Water crossings - This attribute ranks the difficulty of walking across any brooks that the trail crosses on its way to the destination. There are almost no hikes in New Hampshire that require fording or wading through a river, but quick changes in precipitation or snowmelt can make water levels rise and cover stepping stones, forcing you to turn back or get wet. The most important thing to remember is that water levels may be very different in multiple regions, so you should always watch for this while traveling to any hike that requires crossing water. A quick glance to each side while driving across a bridge can tell you if rivers are raging or just trickling. Foliage viewing - this attribute ranks how suited a mountain is for observing autumn colors if applicable. Great foliage hikes are those that are low-elevation compared to the surrounding area and overlook nearby lake or brook valleys. We also provide this rating for ponds and bogs. Crowds on trail - This attribute ranks the popularity of a hike. Many of New Hampshire's iconic outdoor destinations are getting to be very overused, and some hikers want to know where to go to avoid crowds on the weekends. Parking availability - This attribute estimates how much space is available to park at trailheads. Be aware that a hike we rated low in the previous attribute (crowds on trail) is not guaranteed to have available parking, since some obscure hikes begin at parking locations that are very busy for other reasons. Danger when wet - This attribute ranks how dangerous each hike would be under slippery conditions. We thought about the trail surface of each hike, particularly how much rock or ledge walking is involved and how steep and long it is. You must remember that when conditions are exceptionally slippery, like immediately after a downpour, or when spring ice remains, almost any trail that includes even the smallest rocks or an incline can be dangerous. You must also remember that even some trails we rank as "safe" when wet are not neccessarily enjoyable. Many trails are prone to mud or have poor drainage, leading to running water along the footway, but this would be too difficult to rank based on personal experience.